There is finally a brand that has catered to WOC in regards to BB cream. 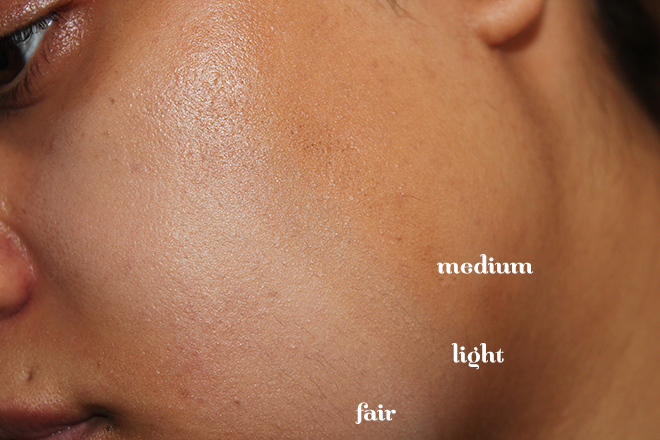 The way I do see it as BB creams originating from Asia, where the women tend to want to be lighter anyway, so not many BB creams are going to be catered for WOC. Shameful that other brands who jumped onto the BB cream trend didn't notice this gap. 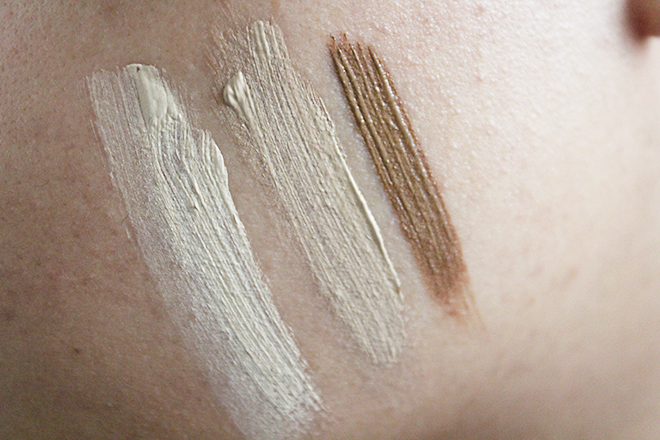 I just about slip in with my random skin tone in re to most BB creams. Though I do still find some are either too light or way off the mark. Would I say I'm the biggest BB cream fan? No, just because I haven't found a drugstore brand that I like. I reviewed the Omorovicza BB Cream but with an £80 price tag and not versatile in shades it's not exactly ideal. I'm going to bring to you : Fair*, Light* & Medium*. I blended them in and took the photo using flash, I knew fair was going to be way too light and leave me looking chalky, grey already. I did think maybe light would blend well and I knew medium was going to be a bit darker it has a reddish undertone. If I buff light in, it's not so bad but it still gives quite a light over all appearance, so what did I do? Found a ratio of light & medium that works for me. Took a couple of tries but once I did have too much medium in, it gave me a very reddish undertone to my face. 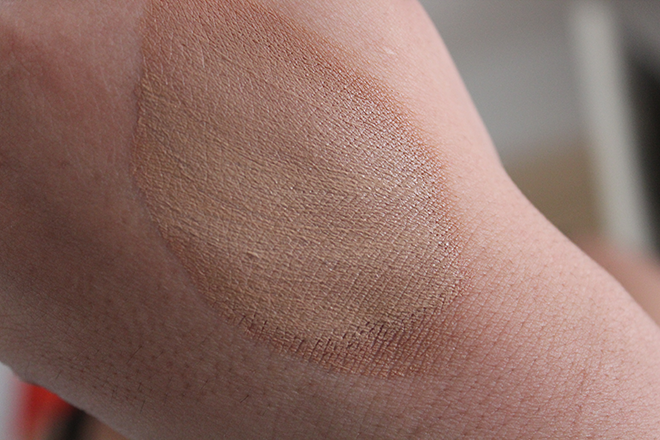 This is the reason why I don't like to swatch foundations/bb creams on my hand - my hand is a lot more lighter than my face ( for once ) or vice versa. That's the shade I came up with for my face. 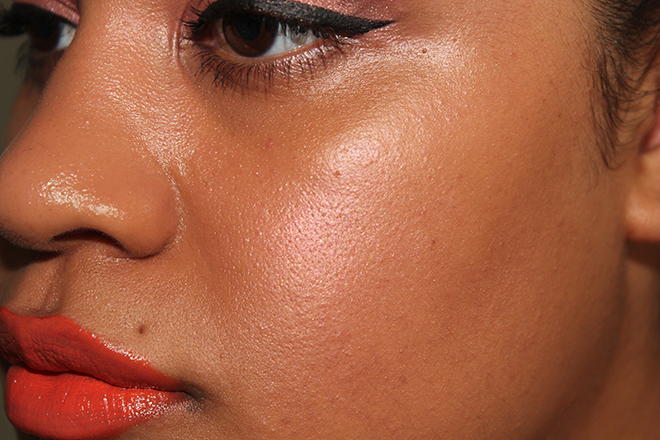 I'm wearing Inika Cosmetics 'Peachy Keen' blush, that's the reflection you've got bouncing off my face, not the cream. It's lightly moisturising, parts of my skin can get a little oily you can see on my nose it's slightly dewy. 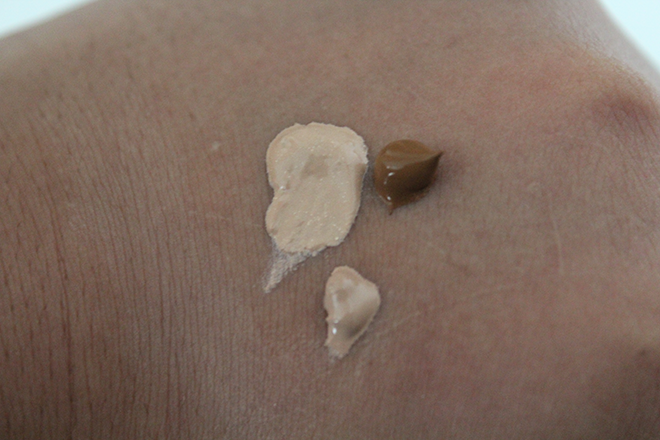 This is only one layer on my skin, I didn't go for two because I liked the results of what just the one layer gave me, it evened out my skintone and anywhere I had slight imperfections - it didn't hide anything that a concealer would need to like dark spots. As I did say it's thicker than any others I've used before but it doesn't feel cakey or heavy on my skin. It's full coverage and I would agree that it does exactly that. The red algae extract within this cream is to help in the prevention of wrinkles and normalises the skin's moisture content as well as promote suppleness to the skin. This cream ALSO contains Vitamin C, so your skin is reaping benefits while wearing this. Over the last week I've read different things about this BB Cream but for me I've not broken out in the couple of days of wearing it constantly and I always have immediate reactions to things. Besides of course having to mix to get my shade, which probably come Winter I won't need to do, I'm going to enjoy this BB cream. I do hope in the long run they do make other shades, in-between shades I shall call them but just the fact they are catering to darker skin tones is a step in the right direction. 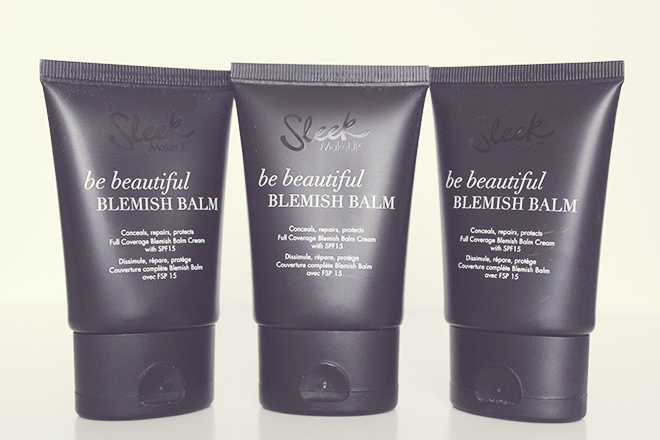 Have you managed to grab a Sleek Be Beautiful Blemish Balm already if not does this interest you to get? You do the best reviews! I was thinking about giving this a go but my skin is a bit weird with Sleek's range I can never find my exact tone - Seeing as they aren't cakey, i'd love to try this when it comes out! \m/ >_< \m/ I appreciate that a lot, thank you! I do try and bring you the nitty gritty in depth lol. Yeah it's definitely not cakey and as I said I've got the one layer on so I'm going to play with build up, it's great that they've got a line for WOC just hope now they can fill in the margin gaps! Wow I didn't even know sleek were coming out with a BB cream..It seems that BB creams are everywhere now..Everyone's trying to bring out their own version and companies like 17 are even reformulating and bringing their BB creams out again in order to keep up with competition. I've only really tried Origins Vitazing which isn't even marketed really as a BB cream but gives the skin an even skintone and actually feels really beneficial for the skin..
Yeah, BB creams are everywhere, I still see the best reviews are the creams that come straight out of Asia but of course there not catered for everyone - I could be wrong there. Oh 17 are reformulating, I really didn't like there's at all! I think the creams aren't for everyone but I said that myself it's probably finding that HG BB cream in honesty. I was waiting for your review on this BB cream thank u hun, fab review as always w beautiful pics. Ur skin does look healthy&flawless I likey! I hate when I fall in between shades of foundations that's my first issue with Mac I'm defo gon get this but think am a Medium shade. Aw thanks lovely, I did try get it up for you from when you asked. Yeah the cream does look great on, cannot lie. It's a pain when you do fall in between shades, definitely would say once in the store just swatch it on your jaw line and see how well it blends just in case you may need to pick up a light to blend but you may get away with a medium & I think you will. Glad you found it informative. I hope you like it once purchased! You gave me an idea! i was thinking to buy the medium one, but on the website its seems too dark for me, and the winter is coming... so i will take my bb cream perfect cover by Missha wich has SPF42 (shade #23=natural beige) and mix with this sleek bb cream one. I hope it will works, cause i hate looking like zombie when im wearing bb cream! Hi! I enjoyed your blog about this particular BB cream as I haven't seen many reviews on it. Have you been able to test the new shades since they expanded? I'm in the US so I have to order online unless I drive to NYC... I'm about Halle Berry's complexion and have very yellow undertones with warmth. Any suggestions? The website seemed like I would be a light 1 or 2. I can't do red, so medium is out and it looked a bit dark. Thanks!